On July 24, 2010, our client Jeannette C. was walking on a public street in Burien when a wandering pit bull approached her and viciously attacked her without any provocation. Investigation determined that the dog had escaped the fenced yard it was confined to through a gate that had been left open while the pit bull's owners, Juan and Aleicia Garcia, were not at their home. The dog lunged directly at our client’s face and throat area, resulting in multiple facial injuries including serious lacerations across her nose and face, and also tore off a sizable portion of her lower lip. Attorney Chris Davis was hired to represent Jeannette C. and filed a lawsuit against the owners of the dog in King County Superior Court on her behalf. It was eventually uncovered that this particular dog had a history of aggressive behavior and had even bit two separate individuals not long before the attack that severely altered our client's life. Attorneys representing the insurance company for the Garcias’ homeowner’s liability insurance policy tried to argue that our client was somehow at fault for the injuries she suffered in the dog attack. The final settlement covered the extensive medical bills and surgical procedures that our client had endured in the years following the attack, as well as a loss of consortium claim that was filed by her husband. 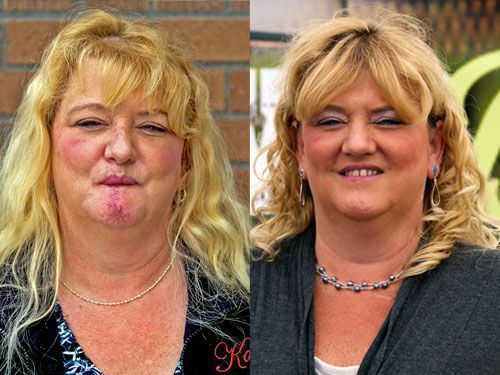 We negotiated a $500,000 settlement for Jeannette Cunningham, who was attacked by a pit bull on a public roadway, scarring her face and ripping off part of her lip. The insurance company initially blamed her for her injuries.